If your little "builder-man" has already paved miles of imaginary roadways throughout your house, then this is the set for him. 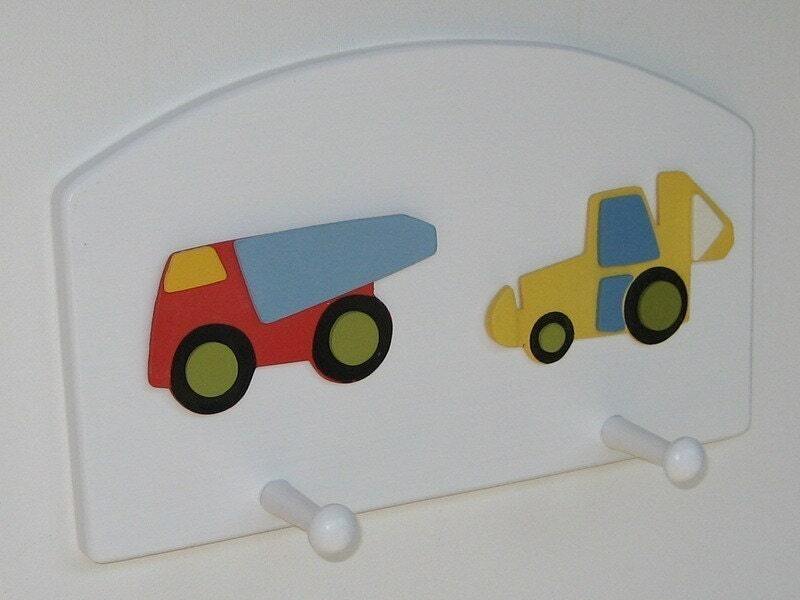 This peg rack has a construction theme featuring a dump truck and a back-hoe digger. It has two, 2-inch pegs for hanging favorite hats, PJ's, etc. Two keyholes cut into the back allow sturdy and stable mounting, flush against the wall. Mounting screws included. Peg rack ships via Priority Mail, estimated transit time of 2 to 3 business days. If ordering multiple peg racks please pay the listed shipping amounts. I will combine the items, calculate the actual shipping weight/charge, and refund any excess postage.